The District was created in 2009, and is a political subdivision of the State of Texas, operating as a municipal management district pursuant to Chapter 3879 of the Texas Special District Local Laws Code; Chapter 375, Local Government Code; Chapters 49 and 54 of the Texas Water Code; Article III, Section 52 and 52a, and Article XVI, Section 59 of the Texas Constitution. The District is vested with all the rights, privileges, authority and functions conferred by the laws of the State of Texas applicable to municipal management districts, including without limitation those conferred by Chapters 49 and 54, Texas Water Code, as amended, and Chapter 375, Texas Local Government Code, as amended. The District is empowered to purchase, construct, operate and maintain all works, improvements, facilities and plants necessary for the supply of water; the collection, transportation and treatment of wastewater; and the control and diversion of storm water, among other things. A significant portion of the District is also empowered to finance certain road improvements. The District may also provide solid waste collection, disposal service and may finance, operate, maintain and construct recreational facilities. The District is also empowered, under its creation legislation, to undertake public parking facilities, transit facilities and economic development projects. The District also levies a sales tax and a hotel occupancy tax within the District’s boundaries. 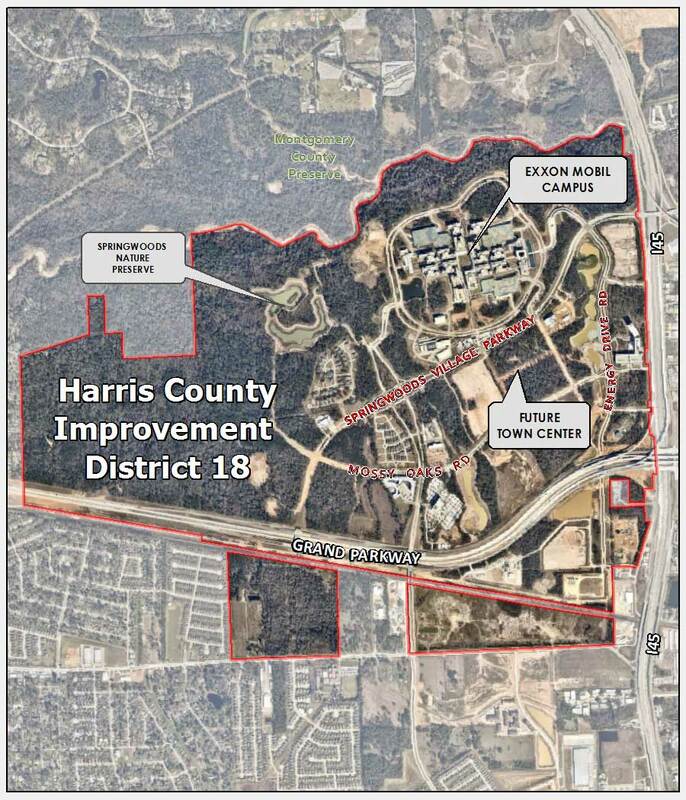 The District encompasses approximately 1,886.8 acres and is located in northern Harris County, Texas, approximately 24 miles north of downtown Houston, approximately 2 miles south of The Woodlands, Texas, a 28,000-acre master-planned community, and is located entirely within the extraterritorial jurisdiction of the City of Houston, Texas. The District is generally bordered on the north by Spring Creek, on the east by Interstate Highway 45, and on the south by Spring Stuebner Road.